Tokenbb Registrations Now Open - Calling all Forum Owners! 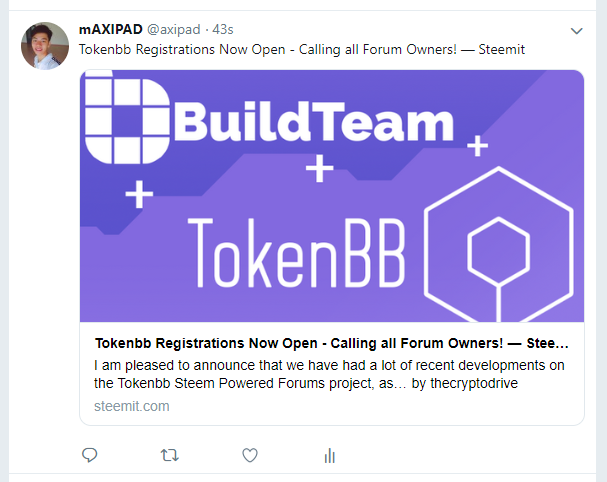 I am pleased to announce that we have had a lot of recent developments on the Tokenbb Steem Powered Forums project, as can be seen by the recent posts and resteems on the @tokenbb blog. Project manager @cryptoctopus had a brilliant use case idea to use the forums to incentivise users to test our product and receive upvotes from the public facing team for good suggestions and bugs found and reported by creating a new forum topic for each bug or suggestion. It is great for gaming communities as well and Drugwars.io will have a test forum soon, the Steem Monsters forum is in the works and a US based Non Profit Organisation has expressed interest in using Tokenbb as well. Incentivised forums are a perfect way for forum owners to create a niche following around their product and creates the demand for buying STEEM and powering up to have enough voting power to reward their users on the feedback they receive. Leasing STEEM POWER is another option that creates demand for Steem based payments, especially if the forum owner does not have enough funds to power up 100K in SP to make rewarding users worthwhile; this can be done at competitive weekly rates on the Minnow Booster Delegation Leasing Market if required. Upvote bots have no effect on visibility within the Tokenbb forums, so it will be a more organic, interpersonal experience. Communication is really fast too and almost feels like realtime engagement is happening. If you would like a forum of your own, please have a look at our demo at https://test.tokenbb.io and see if this product will work for you, bear in mind it is still in alpha stage and not very pretty, there are lots of bugs to be found and reported and you may earn some nice upvotes by giving us feedback. Once you have seen the demo and decided this is for you, then head over to our registrations page on https://tokenbb.io and pre-order a forum, then please be patient and give us a few days to set it up. We have assigned a nominal value of 10 STEEM to be paid to the pay.buildteam Steem account on registration, to discourage spam forum creation. We plan to offer forum owners beneficiary rewards on all topics and comments that occur within their forum and of course Tokenbb will need to earn revenue to maintain its servers and continue development, so Tokenbb would need to earn a share of the beneficiary rewards as well. If this topic is of interest to you and you have suggestions, please leave comments on our forum via this link. The topic is pinned so if you go direct to https://test.tokenbb.io you will easily see it there. Premium monthly fees are also planned if forum owners don't want Tokenbb to share in rewards or if they want to adjust their rewards percentage up or down within the allowed max range. The idea is that we can lower the barrier of entry for new Steem apps if a modular editor is available so the wheel does not have to be re-invented each time. If any devs want to contribute to it, please feel free to get the Github details on the aforementioned post and help make an awesome Steem editor. Please contact @reggaemuffin for more details if needed. By now you may have heard of steem-engine.com, a platform invented by @aggroed, @yabapmatt and @harpagon to facilitate your own token creation on a Steem sidechain with smart contract functionality. We have a vision to incorporate Steem-Engine tokens so that forum owners can reward their users with both Steem upvotes and with custom tokens. Ideally, we would create a way that tokens can be distributed in tandem with upvotes in Proof-of-Brain (PoB) fashion. Alright, if you like what you read here, then head over to our registrations page and order your own forum for your project or community today! If you want to offer suggestions or engage in current discussions, then please visit https://test.tokenbb.io. Lastly, if you have any business related or partnership enquiries regarding the Tokenbb project, please contact myself, @thecryptodrive or our Project Manager, @cryptoctopus. A big fan of @tokenbb as I believe I noted in the panel I hosted with @cryptoctopus at SteemFest 3 (seen below). We've really underutilized two of the key value propositions of Steem so far in my eyes. One being the immutability aspect to give answers to questions and contributions that are of timeless value (Steemit and popular front-ends usually only focus user attention on recent content that can still be curated. Aka less than 7 days old), but as we build a blockchain and product brick by brick, or block by block, this model where we continuously forget what was stated weeks ago only to focus on the present discussion leaves out the opportunity to build... Second, using curation to incentivise people to do exactly that, rather than flocking to whatever is the new and hot topic. I think @tokenbb and the work you guys are doing here can be a best practice example for many dApps and Steem-based businesses to follow, and I have given serious thought today of adding such a forum to our coming updated website for @steempress. Why direct all new users to a Discord (which does not look that serious to most outsiders) when you can have a forum on your website that demonstrates the power of Steem that you are trying to convince people of in the landing page anyways. Again, thanks for the work guys! @fredrikaa I had the pleasure of watching your Steemfest presentation on livestream, thanks for the great work you guys do for Steem. We are honoured that you would consider using our Tokenbb forum app to create a niche discussion bulletin board for your customers and incentivise feedback and suggestions with Steem based rewards. We have just integrated @steempress into our own tokenbb.io WordPress site as well. The registration form is on the site when you are ready, we can get you setup in a day or two. Thanks for the well wishes and we wish @steempress all the best of success and hope to forge an alliance between @steempress and @buildteam going forward. It is glad to hear your words. What will it look like. If we write a comment it will also appear in our website. Can steempress plugin use for the wordpress forum software like phpbb or mybb. This is fabulous! Congrats on bringing back this project bigger and better. Would it work on this scale? @kus-knee, appreciate the encouragement old friend. TokenBB is in Alpha right now but I don't see why it wouldn't scale to that, I will add the link to our task manager for reference. You just gave me an idea for a potential forum.steemsports.com board :). As actifit dapp, we will be looking into this. I can think of at least one useful use case for us but will need to explore it further. @mcfarhat, thanks for your feedback we would be happy to have @actifit create a forum on @tokenbb for the benefit of its users, I think there can be great discussion happening on an @actifit forum. Is actifit.io your project? yes it is! i will look more into that in the coming few days. Btw was chatting to reggae and we will have the new steem-editor as part of actifit.io as well, just working out few glitches together before we do. Oh sweet glad you are using Steem Editor, we should chat sometime on Discord and identify synergies between BuildTeam and Actifit. Certainly! Ill add you on discord and we can coordinate some time to chat. The day I've been waiting for! Looking forward to piecing together a few forums with all this. Thank you, thank you for all the hardwork! The wait is over, go ahead and have fun! Thanks so much @pennsif you are awesome as usual! Will we be able to run closed / private groups (forums) this way? I see that all the post from the test forum appear here publicly on Steemit. Is this just the nature of the open blockchain or will their be a way to run private groups in the future? Hi @connecteconomy, Steem is a public blockchain so the only way to operate private forums would be in an off-chain database or create a specific purpose permissioned sidechain, which is not on our scope for 2019 at least. 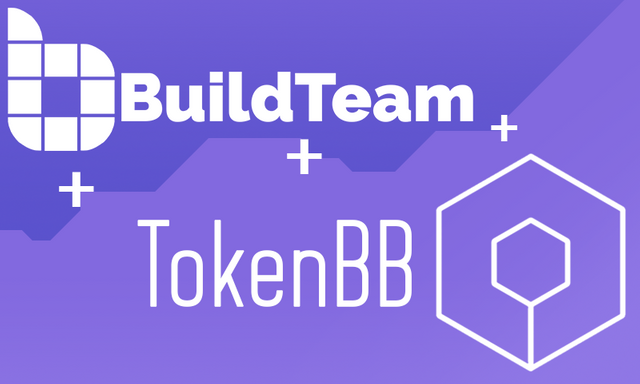 TokenBB is a native Steem project and thus private forums would not be a focus in the short term, but I will add it for consideration to our long term roadmap. Amazing! I’m depressed I haven’t had a chance to even explore and test TokenBB yet personally. I’ll need to rectify that soon. I really enjoyed ChainBB and dabbled with a forum before it shut down, I’ll be looking to do so again! Look forward to seeing your posted topics on https://test.tokenbb.io :) your experience with ChainBB will be valuable. A forums project on Steem that was abandoned. Please announce these major things in BT discord so its harder to miss them. Been wondering if you would be doing anything with the BT tokens you made on the Steem engine? Similar to the BT tokens on bitshares. 2.) The BT tokens on Steem-engine are placeholders until we build a Bitshares bridge between the two and figure out how we want to issue them, there is no marketplace yet on Steem-engine for price discovery. Cool not just one hug but three :) very generous. Wow great to hear that Steemmonsters and Drugwars are going to utilize your Forum service. Sounds very interesting and exciting to me, good work! Yeah, we are proud to have them as pilot forum examples, glad you are as excited as we are! Great work guys. These forums open up a whole new frontier for the Steemit ecosystem. Voted for your witness! I agree, and I personally use @blockbrothers as a proxy for witness votes. Awesome, we support their witness! Thank you so much, I'm feeling so much love on Steem it feels like the old days. Your vote is really awesome, hope Tokenbb is of use to you. I am excited for this deployment as it will provide yet another way to engage with the community and will offer more use cases for organizations to come into our ecosystem and participate and potentially create communities surrounding their products and services. Nice, external exposure is a good idea! 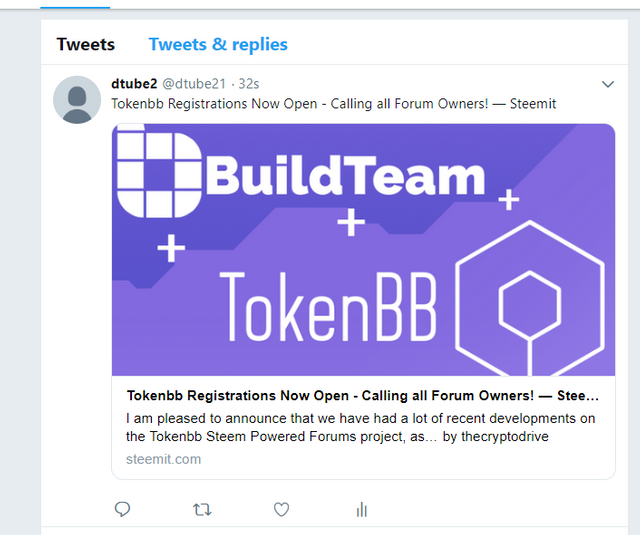 Great that forums not invloved in Steem platform are also getting to know about Tokenbb. It is an initial step in the success of Tokenbb. Already registered for the alpha! Looking forward to hear more about the Engine integration. Steem-engine won't be an overnight thing, the forum is very barebones still so we need to address all bugs, features and themes first. Thanks for registering, I believe you are having good talks with @reggaemuffin regarding development. @thecryptodrive Great project! Having something like Bitcointalk on Steem would give a real boost to the Steem ecosystem. Upvoted and resteemed. Much agreed, we thought the same thing. We provide the forum infrastructure, we just need forum operators in all genres to do their thing. If you or anyone you know want to start a bitcointalk rival please do. I don't understand very well. Please explain me. We need to have a website. Tokenbb is a software that need to install in our website to post in steemit. So Every user has to login to post in their blog. Fourm owner don't get anything if they use free service. So steempress plugin is needed to integate otherwise the forum owner need to have at least 100K SP to incentive the visitors. Can we have a chat on Discord? Give me your Discord username and i’ll contact you, easier to explain there. 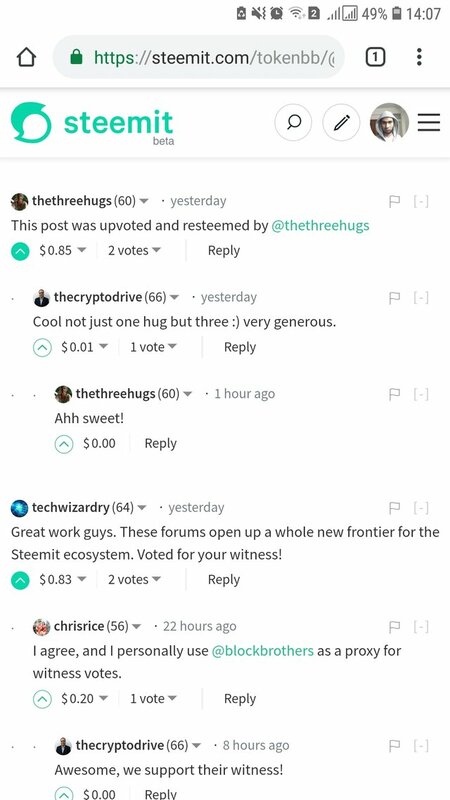 Great work gays .these forums open up a whole new frontier for the steemit ecosystem.vote from your witness! My VP is too low to vote any more comments, really sorry, you have my thanks though. You made more than 57000 upvotes. Your next target is to reach 58000 upvotes. @steemium purchased a 22.72% vote from @promobot on this post. I am very happy to support you. This post has received a 25.33 % upvote from @boomerang. About 48.21$ has been spent to promote this content. A very good project. This will bring about crypto adoption everywhere. @thecryptodrive I want to know if the forum software comes in different languages? I wish to use it in a French setting. Hello @thecryptodrive! This is a friendly reminder that you have 3000 Partiko Points unclaimed in your Partiko account! I am curious how it will turn out!